A sign posted at a Utah theatre informs patrons that "Brokeback Mountain" will not be shown. 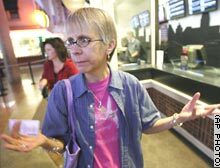 Carol Adams of Sandy, Utah, expresses her frustration at the theater's decision. 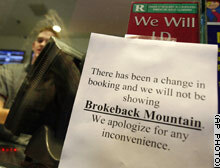 SALT LAKE CITY, Utah (AP) -- A movie theater owned by Utah Jazz owner Larry Miller abruptly changed its screening plans and decided not to show the film "Brokeback Mountain." The film, an R-rated Western gay romance story, was supposed to open Friday at the Megaplex at Jordan Commons in Sandy, a suburb of Salt Lake City. Instead it was pulled from the schedule.